Something I am quite passionate about on this journey out of Post Partum Depression is that it is HARD WORK. There are healthcare professionals and people I know that believe that Post Partum Depression or any type of Depression is simply an imbalance of hormones or serotonin levels. I agree that this is part of it, but I firmly believe that drugs and the passage of time, alone, does not magically cure depression. At least not for the average person. There are other factors that need to be addressed and those factors are different for everyone. And yes, there are cases where medication for life is the answer. I totally believe that. If I would solely depend on the medication that my doctor subscribed to me and allow myself to give in to the hopeless feelings depression brings on, I don't think the medication would completely do it's job. The reason I say this is because I have seen people who go on medication and rely on it alone and never get better. It's as though it is easier just to stay in the crevasse than do the work to get out of it. Yes, the medication makes things a little better, but there are other things that need to be worked on. And they are hard work. And yes, sometimes it feels like it would just be easier to stay in that hole because it is hard work to pull yourself out of the crevasse and back onto solid ground. Prayer: These past months I have found that I am so exhausted and weary and anxious that my journey with God went by the wayside when it is what I should be holding onto the most. I needed something basic and repetitive to get me back into the swing of things.I mentioned my journaling using the Prayer of Examen HERE. Prayer is a form of serving God (Luke 2:36-38) and obeying Him. I pray because God commands us to pray (Philippians 4:6-7). I pray because Christ and the early Church were an example in the area of prayer (Mark 1:35; Acts 1:14; 2:42; 3:1; 4:23-31; 6:4; 13:1-3). If Jesus thought it was worthwhile to pray, I should also. If He needed to pray to remain in the Father’s will, how much more do I need to pray? I pray to obtain the means of strengthening others spiritually (Ephesians 6:18-19). We come to God with our specific requests, and we have God's promise that our prayers are not in vain, even if we do not receive specifically what we asked for (Matthew 6:6; Romans 8:26-27). The thing that gets me the most and makes this prayer thing 'Hard Work' for me is that a lack of prayer demonstrates a lack of faith and a lack of trust in God’s Word. We are to pray to demonstrate our faith in God, that He will do as He has promised in His Word and bless our lives abundantly more than we could ask or hope for (Ephesians 3:20). Because it is our means of “plugging into” God's power, it is our means of defeating Satan and his army that we are powerless to overcome by ourselves. And I find that when in a state of Depression I feel Satan's attacks much stronger than when I am healthy. I think this is because he sees this as an opportunity to get me down. Isn't that his point? This means that, for myself, I need to be before God's throne more often. God can identify with all that I am going through (Hebrews 4:15-16). We have His promise that the fervent prayer of a righteous man accomplishes much (James 5:16-18). So, I find myself getting back into the hard work of prayer, knowing that one day soon it will be as easy as breathing again. Self care: I have been on autopilot, trying to keep the kids dressed, fed, clean and semi-happy. That was all I could manage, it felt like. In the process of surviving, I forgot myself. For various reason (mostly related to the challenges that Olivia brings to our lives) I could not sleep from 3:30 a.m. until morning. It has taken a lot of 'hard work' and learning some new 'sleep hygiene' strategies to get me to a state of semi-normal sleep. Because I was/am lacking sleep, I was also lacking the energy to do any of the things that I once enjoyed. Scrapbooking, blogging, reading, time with friends, etc. So now I am forcing myself to carve out some time in the day to do at least one of these things every single day. That is a challenge, especially with the holidays, family staying here, and the lack of energy. But I have been somewhat successful and that feels good. I have to work hard at carving out that time and sometimes 'demanding' that time of myself in a day. Children: Kids have this inner radar that seems to let them know when Mama or Daddy isn't doing well. Somehow they just know that their little world isn't quite right and more often than not, insecurities and 'mis-behaviours' seem to shine through. Their way of reacting to things. With the lack of energy and everything that is going on with me, I know how much I have to work at carving out special time with the kids each day to make them feel loved and secure. That is hard work when healthy, never mind when going through depression. But it is worth that hard work because I want our children to feel loved and secure and that their life at home and in the world is a safe place. When re-reading this it sounds like I am too hard on myself. That outside support is lacking. Please don't take it that way. This post is not about outside support (I need to write a post on that too). This post is about the hard work I feel I need to do to help myself get out of this depression. Yes, medication and time will do it's part, but I know I need to do my part too. I know that when coming off the medication it isn't going to be some magical cure. Medication is a part of the solution but not the ultimate answer. For me I know that I need to have things in place for myself spiritually, for my own personal well-being, my marriage and children, so that when I get out of the crevasse and back to the top of the cliff and can stand on my own two feet without medication, I have strategies in place to keep the different parts of my life under control. If I rely on the medication on its own and have no strategies in place and have let my spiritual life, self care, marriage and children go to the wayside or depend on everyone else to do everything for me, I will have no strategies in place for how to manage each and make them thrive. 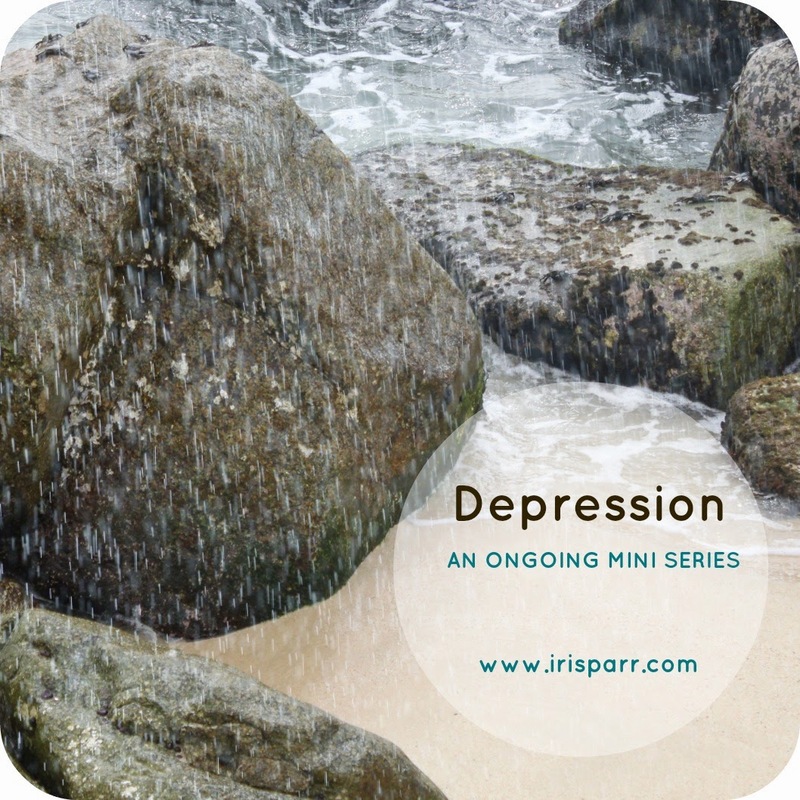 That is often when post partum patients find themselves diagnosed with long term depression. I could possibly find myself at the bottom of that crevasse again and that is not a place I am willing to go again. So, to me that is hard work. But hard work is not a bad thing. To me a day of hard work leaves me feeling good about myself and my accomplishments. It is worth the hard work at the end of the day. Children - there were times, especially at the beginning when parenting was overwhelming and caused anxiety. I remember specifically one week, near the beginning, when my parents took all of my kids for 3-4 days and during that time I did so much better. But as the depression continued and my anxiety got worse, and I began the hard work of managing it, I craved their ... holiness, their innocence, their tenderness. It's hard for me to describe. I just knew that I was more present and less in my head when they were around. I was getting them milk, getting them dressed. I needed the distraction that they brought to my life. I remember sitting with Abby, who was in Kindergarten and watching Survivor every Thursday afternoon. Her little body beside mine, watching this stupid show that she was probably too young to watch was one of the little things I looked forward to during my week. Little acts of grace (why did she sit there with me through that show that probably didn't even grab her attention) and kindness meant the world to me. Prayer - the only praying I did during that time were prayers of gratitude, in my journal mostly. I wrote them out everyday, especially right before bed and I imagined God's arms wrapped around me telling me how much *she* loved me. I needed to be mothered and nurtured during this tender time in my life and imagining God in a female form as a nurturing mother gave me a deep sense of peace. I also prayed that I would learn all there was to learn during this time of depression. Those were the only prayers I uttered. Marriage - If Dale hadn't gone through his own depression I know it would have been more difficult for us. But since he knew what I was experiencing he knew what was helpful and what wasn't. I couldn't watch TV b/c I had too much anxiety watching it (stomach in a knot, mind racing, hot sweats, etc), so Dale and I would spend almost every evening out in our sunroom drinking tea and talking. Almost every single day. He would tell me about his day and I would talk about all the deep thinking and learning I'd done, b/c for me, it was the only way I thought in my depression (deeply). I'd read him poems or passages of books that I was thankful for that day. It sounds so romantic now, doesn't it? Then it was coping, surviving. It's all I could do and Dale knew that and honoured that. Love that guy. Self-care -- for me, this happened mostly in my head. I did spend time with friends, went for massages, wrote, meditated, etc, but for me the most meaningful self care came in the form of listening to love songs and pretending that my healthy self was singing them to my sad, broken, anxious, messed up, depressed self and loving her back to health. It sounds so hokey, self absorbed and stupid, but it was so effective in reducing my anxiety and helping me to accept the situation I was in and grow and learn from it. Welcome what it had to teach me and to give me. I strongly believe that my change in thought patterns and self kindness is what brought me healing. I tried to see myself as God would. To love myself as God would. I found that the more I was able to see myself this way, the more I began to turn my empathy, compassion and mercy (I worked on giving to myself) toward others. And as I made this switch things turned around for me. I remember going from feeling utterly anxious walking through the grocery store to catching peoples eyes, seeing their hurt or their sadness and being overcome with compassion and empathy for them. I actually miss the deep connection I had to others suffering. It felt real and right. I rarely feel that same heart and soulful connection, that knowing to other's suffering. It's hard for me to describe in words. Love you, girl. Love your thoughts, your vulnerability, your insight, your processing. You are a warrior! !